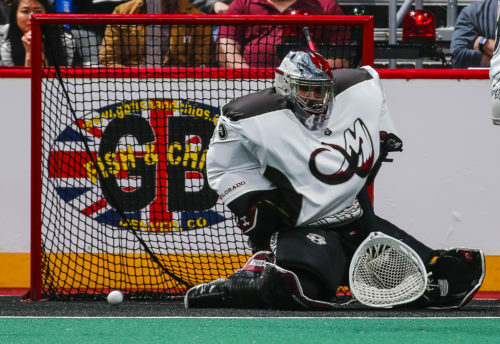 On the night where the Colorado Mammoth retired John Grant Jr.’s jersey, the home team would have hoped to earn an easy win over the last-place Vancouver Stealth. Instead, the Stealth came from behind in the final eight minute of the game to steal the 13-12 victory. The evening opened on a high note as the Pepsi Center crowd was treated to the ceremony to officially retire Grant’s jersey and raise it to the rafters. Grant spent the last seven years of his 17-year NLL career with the Mammoth and set the league record for most points in a season (116, since broken) in 2012 as a member of the team. But after that, the Stealth quickly silenced the crowd. Vancouver scored the first four goals of the game, building the biggest lead the game would see as well. Colorado clawed back in the latter moments of the opening period, ending the quarter with just a one-goal deficit. The Mammoth would hang on to the momentum going into the second quarter, scoring three more times to take a 6-4 lead, before the Stealth began another three-goal run of their own to retake the lead. After that, the two teams traded goals back and forth for the next quarter and 21 minutes of play, neither team able to break away. Finally, in the fourth quarter, Colorado went on a three-goal run of their own to take a two-goal advantage. The Stealth then went back to work, tying the game once again less than a minute after Colorado’s last goal. Pat Saunders finally put the game away at the 13:12 mark on his second goal of the night, on a shot that took a funky deflection off a defender to beat Mammoth goalie Dillon Ward. Rhys Duch (1 goal, 4 assists) and Tony Malcom (2 G, 3 A), led the way for the Stealth with five points apiece; Ran Benesch (2 G, 3 A) and Jacob Ruest (3 G, 2 A) had five points each for the Mammoth. The loss drops Colorado to 9-4 on the season, but they still remain solidly in second place in the West Division. Vancouver earned their second win of the season and keep their slim playoff hopes alive. Colorado travels to Toronto to face the Rock next Friday, Mar. 30 while Vancouver hosts the Calgary Roughnecks on Saturday, Mar. 31 in a game they have to win to stay in the playoff hunt.